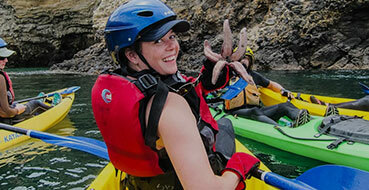 Since 1998 Santa Barbara Adventure Company has been helping visitors plan amazing trips to California’s Coast. Our local staff answers all types of questions about tours and much, much more. Recently we sat down and created a helpful Santa Barbara Traveler Planner that anyone can download free. We know it takes a lot of hard to work to have a great time. We have a full time staff working on this every day! What will you find inside the Santa Barbara Travel Planner? First, you will find information on what we know best — the trips and tours offered in the area from Channel Islands kayaking to Santa Ynez wine tours. Read about tours that are perfect for a family, business group or romantic get-a-way. Santa Barbara is full of historic buildings and educational spots – we included all the addresses and tour information for the Courthouse, Mission and much more. We didn’t leave out the essentials – Airport, hospital and pharmacy information — all this is included as well. Did we miss something? Please let us know in the comment section below so we can continue to make our materials as helpful as possible.